Rangers James Tavernier (second left) celebrates scoring his side's third goal of the game from the penalty spot during the Ladbrokes Scottish Premiership match at Pittodrie Stadium, Aberdeen. Jeff Holmes/PA Wire. Rangers cut Celtic's lead at the top of the Ladbrokes Premiership to three points after a dramatic 4-2 win over Aberdeen at Pittodrie. Steven Gerrard's second-placed side started the evening two points ahead of the Dons, who sit third, and got off to a strong start at Pittodrie. Alfredo Morelos gave Rangers a 20th-minute lead in their clash at Aberdeen in the Ladbrokes Premiership. Ryan Kent's shot was saved by home goalkeeper Joe Lewis but the loose ball fell to Morelos and he fired home. Aberdeen were back on level terms on the half-hour when Sam Cosgrove fired home from close range after Lewis Ferguson had seen a volley attempt blocked. Rangers were back in front seven minutes later through Morelos' second goal of the game. The Colombian collected a pass from Kent and slotted in his 23rd goal of the season. Rangers, who were awarded four penalties on Saturday, got another just before the break at Pittodrie. 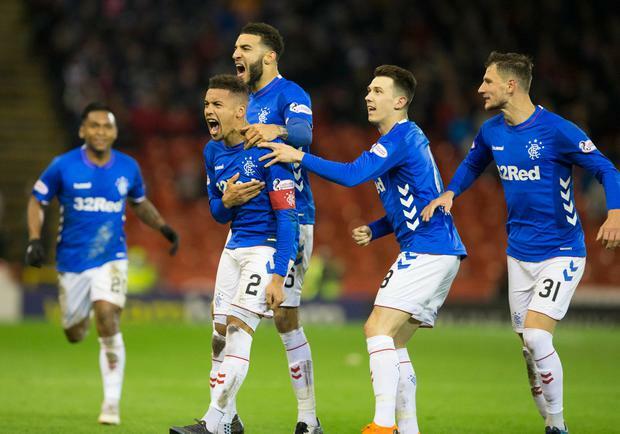 James Tavernier, who scored two of the weekend spot-kicks and missed a third, made no mistake with this one to put the visitors 3-1 up. Aberdeen pulled a goal back at the start of the second half after Tavernier was adjudged to have hauled down Ferguson at a corner. Cosgrove stepped up and slammed in the resulting penalty to make it 3-2 and take his tally to 12 goals in his last 12 games. Both sides were reduced to 10 men in the 53rd minute when a tussle involving defender McKenna and Morelos ended with the pair kicking out at each other. The Rangers striker was down injured but once he was back on his feet, referee Bobby Madden also showed him a red card - his fourth of the season. Jermain Defoe sealed the points for Rangers with a fourth goal in stoppage time, while Celtic were comfortable 2-0 winners against Hibs. Leaders Celtic went ahead after 25 minutes of their home game against Hibernian. Scott Sinclair was inches away from the opener just moments before Ryan Christie's strike. Neat interplay involving Timothy Weah and new signing Jeremy Toljan finished with Christie drilling into the bottom corner. Celtic doubled their advantage after 64 minutes when Oliver Burke turned in a pass from Christie.